Have you ever attempted to extract your load of laundry after a full cycle only to find that your clothes are still wet? 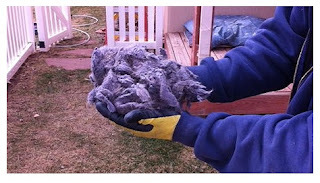 That’s a telling sign that your dryer vent is clogged, blocked, or it’s exhaust seriously inhibited by ancient lint and debris. Dryer Duct blockages your dryer at best case to dry more slowly and worst case can cause damaging and dangerous house fires. It's essential to have your dryer duct inspected and cleaned to decrease energy usage and to ensure the safety of your home and family. If your dryer isn’t functioning properly, call Aeroseal of the Lowcountry before the dryer maintenance man. It may be a simple ventilation issue and with the aid of our technicians and equipment, we can reach even the toughest places to give you a through cleaning of your ducts! We will extract lint and clean your vent allowing your dryer to breath and you can rest easy knowing that not only are you saving money on your energy bill but your also preventing a future residential fire. If you're around Hilton Head Island or Savannah or in the surrounding area and you need dryer vent cleaning, you can count on Aeroseal of the Lowcountry, where we excel at providing premier service to our customers. To learn more,complete our contact form or give us a call at 843-547-2191 and we will be more than happy to assist you with your needs.